Den Bosch is fully named ‘s-Hertogenbosch and is the capital of the province where I was born: Noord-Brabant. It is the birthplace of famous artist Hieronymus Bosch and the largest walled city in The Netherlands. The medieval city centre of Den Bosch, with its churches, canals and wharves, is the main attraction. But the bustling cafés, that you seem to bump into every few meters, cute boutiques and fine restaurants will keep you occupied for quite a while. 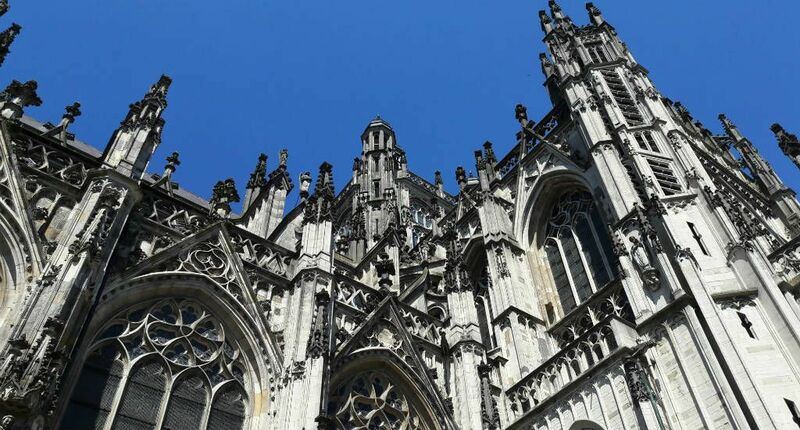 Check out my complete city guide Den Bosch. ‘s-Hertogenbosch means ‘Duke’s Forest’ and this says quite a lot about the history of Den Bosch. The duke in question was Henry I, Duke of Brabant, who granted Den Bosch city rights in 1185. Before that, Den Bosch was pretty much an important place of trade on the spot where several small rivers met. Originally, the city was built as a fortress and most of those medieval city walls are still intact. Hieronymus Bosch is probably the cities most famous inhabitant and he was born in the 15th century. He was a witness of the biggest fire in 1463, that pretty much destroyed the entire city and it really makes you wonder if this event influenced the chaotic and demonic scenes in the paintings he became so famous for. Den Bosch is pretty compact and you can basically see all you want to see by walking around. If you don’t have a lot of time, I highly recommend taking the free walking tour. It runs daily with an English speaking guide at 11 am, a Spanish guide at 2 pm and an Italian speaking guide at 5 pm. Den Bosch is a city of canals and waterways. If you would like to see Den Bosch from a different angle, it’s great fun to hire a small boat (called a ‘sloepje’) for a few hours or the entire day. On this map, you can see where to go by boat. 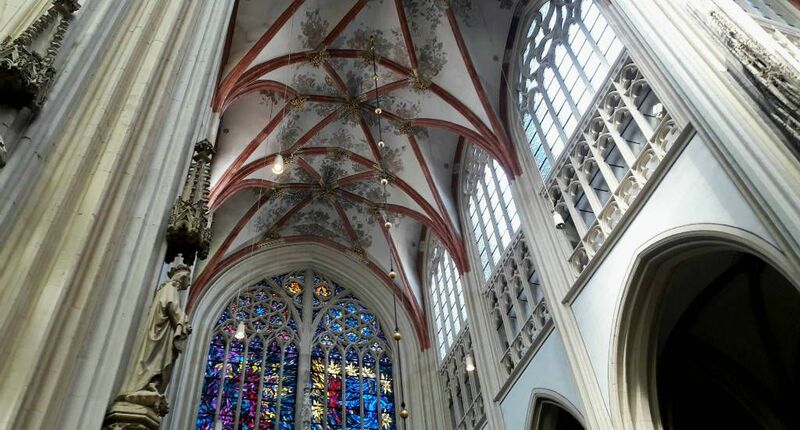 I have seen my fair share of churches and I have to say: this is the most beautiful cathedral in The Netherlands. The construction started in the 14th century and took 200 years to finish. The ceilings and stained glass windows are simply stunning. The cathedral was renovated recently and an angel holding a cell phone (!) was added to the exterior. 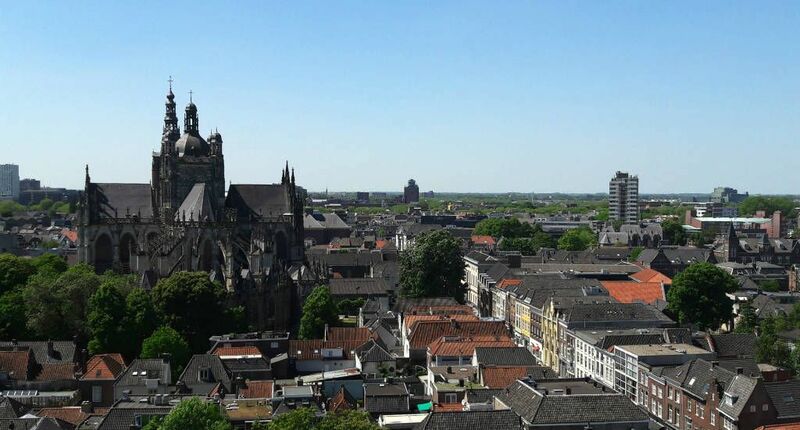 If you climb the 73-meter high tower you can see the carillon and some fine views from the top. You really want to get to know Hieronymus Bosch a little better during your visit to Den Bosch and the Jheronimus Bosch Art Center is the best place to start. It’s housed in an old church and uses interactive exhibits to showcase the life and work of the artist. There are reproductions of all paintings by Bosch, which can touch and see from as close as you like. Take the elevator up into the tower for excellent city views (even better than the ones from the cathedral, or so I think). The Binnendieze is a small river that runs through and underneath the city. 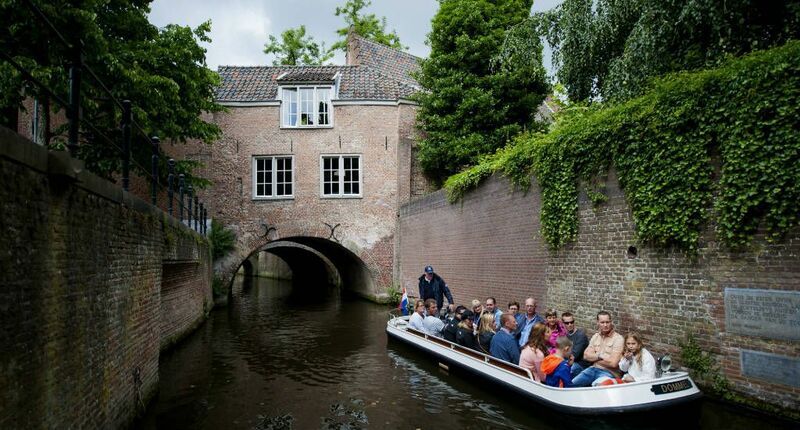 A guided boat trip on this small river gives you the opportunity to explore the finest and most hidden spots in the historical centre of Den Bosch. The Noordbrabants Museum is an absolute gem and highlights Brabant history and Dutch art since the Renaissance. A separate pavilion is completely dedicated to Brabants own Vincent van Gogh. A corridor connects this museum to Stedelijk Museum for modern art. You simply can’t miss the impressive city hall in the middle of the Markt square. City hall has been on this spot since the 13th century but was heavily rebuilt in the 17th century. During office hours you can take a look at the city hall and you can view beautiful paintings by Antoon der Kinderen, but also don’t skip the city boardroom with historical tapestries, and the gallery depicting the Royal House of Orange. You can’t leave Den Bosch without tasting a Bosschebol at Jan de Groot. Bosschebollen are one of the foods that we Brabanders are famous for and proud of. And at Jan de Groot, you can eat the best Bosschebollen in Brabant. Bosschebollen are large profiterole like pastries, filled with whipped cream and covered in chocolate. A bit messy to eat, but no one cares! The bakery, which also has a tearoom, is close to the train station. This was once a tram depot, but the old depot and warehouses are turned into creative workspaces, clubs and concert halls. If you’re into music, better check their calendar to see if there’s a cool concert or party going on during your visit. If you say ‘Verkade’ to a Dutch person, he or she will immediately say ‘cookies’. And the big Verkadefabriek used to be only a short walk from Den Bosch train station. When the production line was moved elsewhere, the historically industrial area was turned into a cultural hotspot. You can see street art at Verkadefabriek, go to the cinema or have a bite to eat. I think it’s absolutely lovely, so go have a look. Den Bosch doesn’t have an obvious street art scene, but if you look for it, you will find some really great murals. 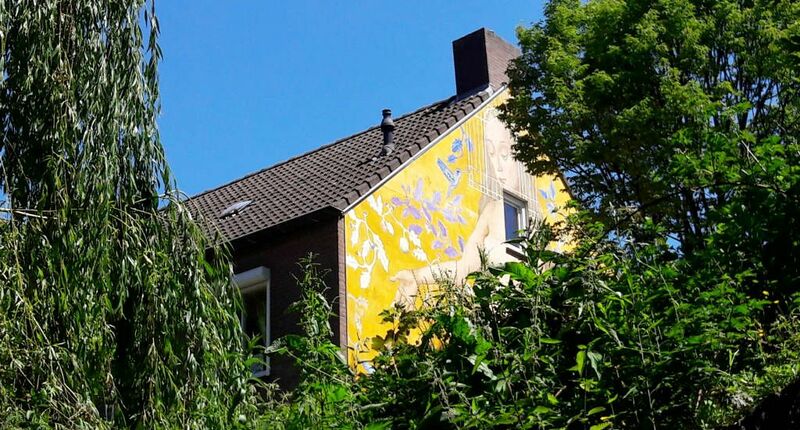 The Dutch website Den Bosch tips has mapped out a short walking tour that you can take to see some great street art in Den Bosch. DIT has to be my favourite place for lunch or drinks in Den Bosch. 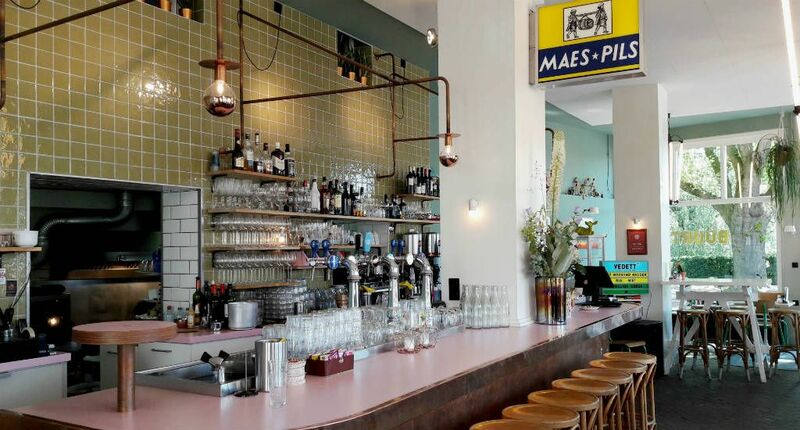 The bar is situated in the cute Snellestraat and offers good lunch, an extensive drinks menu, shady outdoor seating and always smiling staff. The triangular square where Nom Nom is located has to be the most fun terrace in Den Bosch. Locals love coming there and it’s the best place for people watching. A little outside the city centre (but the walk along the canal to get there, is so worth it). I used to have many work drinks and do’s here, as I used to work a lot with a company close to Buurt. It’s a lovely spot for coffee, lunch or drinks. Within a minute from the train station, good coffee awaits. This café has only opened its doors recently but is already very popular with locals. It’s a good place to order breakfast (the french toast or eggs Benedict, oh my! ), a piece of homemade cake and some coffee or tea. Kaserne is one of the most prestigious restaurants to eat in Den Bosch. It’s set in a beautiful old building, which once used to house military vehicles. The menu is filled with dishes made from local produce. If you’d like a little bit of a tasting feast, order the Kings menu or Bastion menu. If you’re into good burgers, proper steak and fine sirloin: grab a table at m’Eat. All meat is cooked on a Green Egg (a ceramic charcoaled bbq). If you don’t feel like a big plate of food, you can just order some finger food and snacks. 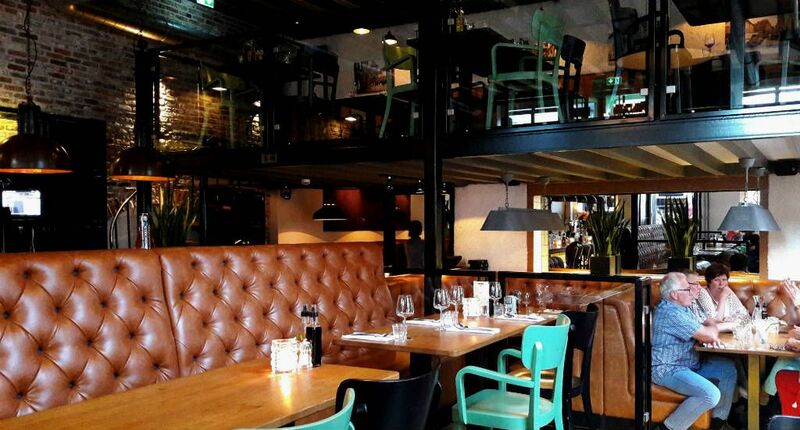 Korenburgstraat is a perfect choice for drinks or dinner because the street is more or less one big bar. Sitio is situated on one of the corners, has outdoor seating, and is a good spot for dinner. The restaurant is especially famous for their meat and pasta dishes, and I was particularly impressed by their surf ‘n turf and extensive wine list. When the weather is nice, I highly recommend stealing a seat outside In de Keulse kar as you are at the foot of the cathedral. The staff is friendly, there are good beers on tap and you simply can’t beat the view. 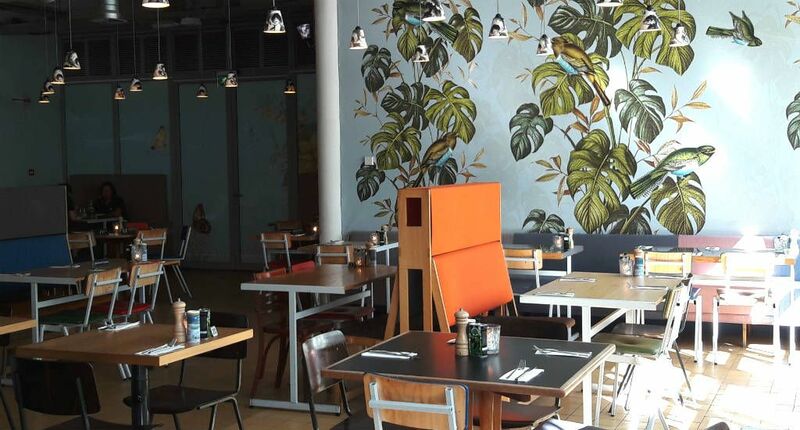 At Tramkade you will find Van Aken, which is both a restaurant and club. Don’t be put off by the pink walls, as you are surrounded by design by the best Dutch designers. You’ll eat from plates by Edwin Vollebergh, sit on Piet Hein Eek furniture and lean back on pillows designed by Marc Mulders. Quality for little money, at a great location. 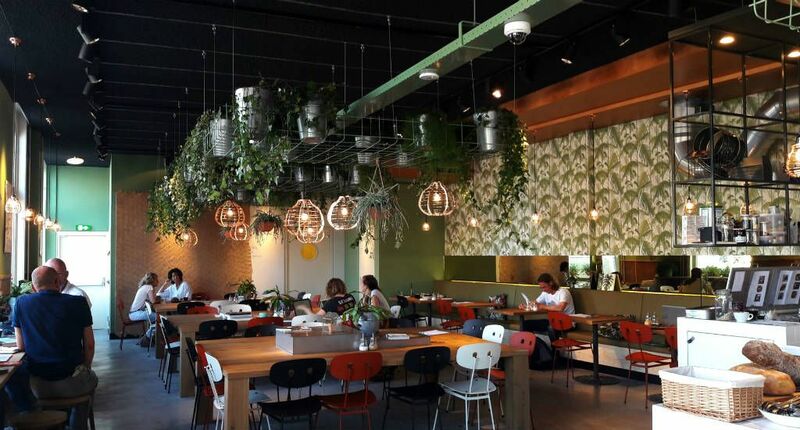 Little Duke is less than 100 meters from the train station and a good central place to discover Den Bosch from. The rooms are not very big, but efficiently decorated and painted in bright Pantone colours. Every room has a SMEG fridge (there’s an evening shop next door and café downstairs). It’s good value for money. This B&B is beautifully located (and a short stroll from Buurt), close to the water, but still a minute away from all the historical highlights of Den Bosch. 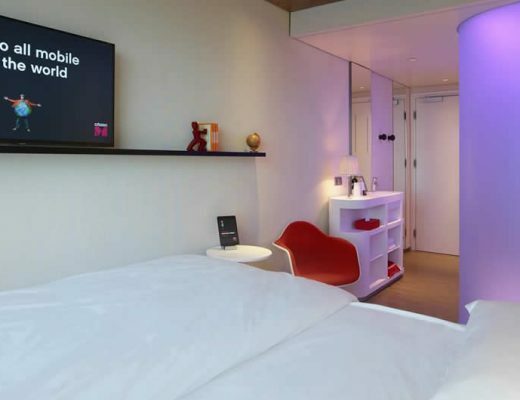 The rooms are furnished with fun and modern design items, and the atmosphere is just completely ‘gezellig’. This amazing hotel is situated in a renovated cloister and its name translates to ‘The Sweet Mother’. You’ll be staying a little outside the city centre, but all the sights are more or less a 10-minute walk away. The rooms and common areas are all delightfully modern, but you can still see all the ancient cloister details, like the staircase, stained glass windows and beautiful tiled floors. About all the other cities in The Netherlands.